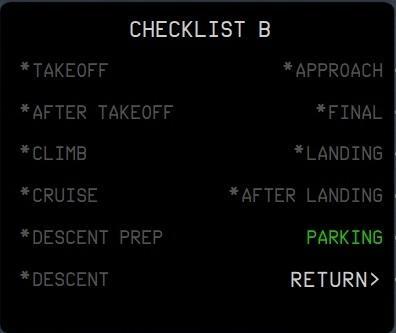 In the A320 the checklist hangs after at FINAL. 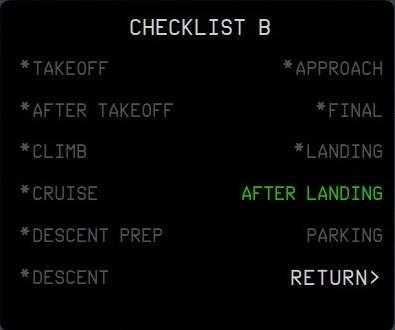 The LANDING checklist is started when the aircraft touch the ground but not the AFTER LANDING and PARKING. In the MCDU3 DESCENT and FINAL stays flashing. I repeated the flight about three times and it always happens the same thing. This (link below) is exactly what is happening to me. I will check the issue of speed greater than 35 kts and the 15 seconds for the AFTER CHECKLIST to start. I will back with news. New flight, new route and again the same problem in the checklist has occurred. 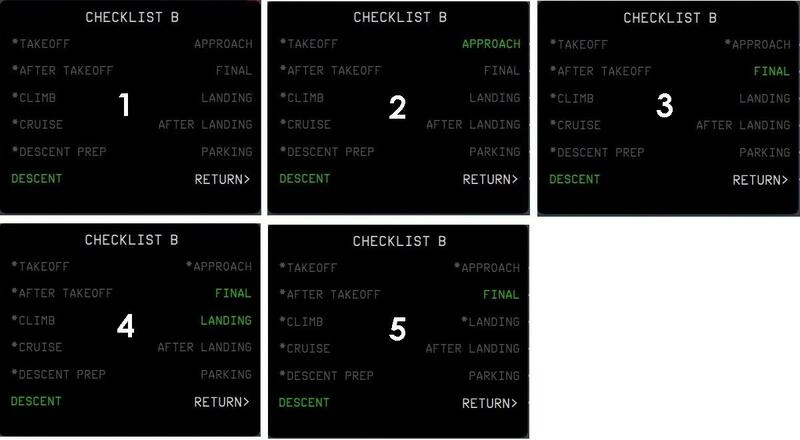 The checklist stops in LANDING (number 5 in the attached image). The image sequence of events is: 1 - DESCENT, 2 - APPROACH, 3 - FINAL, 4 - LANDING and 5 - after the landing and taxiing to the gates. The first four were wel done and the last one had fail. I'll take the requested screenshots. There were two short and smaller flights than 200 nm made with the A320 PRO 2018. Both departing from runway 02R of SBRJ (Santos Dumont, Rio de Janeiro). FIRST FLIGHT TO "Congonhas, São Paulo" AT FL220. "SBRJ IH1A UMBAD Z11 KEVUN UGTE1B SBSJ" with transition in KEVUN and landing by ILS of runway 15. SECOND FLIGHT TO "São José dos Campos, São Paulo" AT FL320. "SBRJ IH1A UMBAD Z11 PAGOG KOMG3A SBSP" with transition in PAGOG and landing by the ILS of runway 17R. THIRD FLIGHT => I will do the LOWILFMN01.flp that comes in the "A3XX Flightplans" folder. I did the flight LOWILFMN01.fpl and it went well. This time the "AFTER LANDING" and "PARKING" checlists were run without problems. I did another flight. This time from EGKK to EHAM on the FL250 and using the flight plan "EGKK CNL9V.CNL UL620.REDFA REDFA1A EHAM". The arrival at EHAM was at runway 18R and using its ILS. Everything went well and all the checklist steps worked. What I am trying to demonstrate is that all my flights are done in the same way, I mean, in the simplest way that is using the automatic checklist. So the fact of the checklist works correctly in some flights and in some others not, it's a mystery to me and I am asking help. uhmm... "think about it what is different" this can be the way. I did another flight to a third airport (SBGR) at the same state (São Paulo) and again the checklist stoped at LANDING. So I have three unsuccessfully flights against two well done. The first difference that comes to mind is the altitude of the airports. The three failed flights were to airports above sea level, i.e. SBSJ (2119 ft), SBSP (2631 ft) and SBGR (2457 ft). The two well done flights were to LFMN (13 ft) and EHAM (-10 ft). Ok, the next flight will be to an airport at sea level. Let's see. The FINAL and LANDING works OK. The AFTER LANDING and PARKING are the steps not executed. Something like if the code do not recognize that the aircraft was landed and is already on the ground and leaving the runway, so much so that on the last flight to SBGR, when I taxied to the gate, stoped and activated the parking brake the call out was "HUNDRED ABOVE" that is a call out for LANDING. One question: We have a similar problem with the LANDING CL if the A319 IAE is used e.g. the LANDING CL is not performed but all the rest is working well. Are you by the way also using the A319 IAE? Uma pergunta: Nós temos um problema similar com o LANDING CL se o A319 IAE for usado, por exemplo, o LANDING CL não é executado, mas todo o resto está funcionando bem. Você também está usando o A319 IAE? With A320 used "A320-214 CFM SHARK" and "A320-232 IAE". I also have the same problems using "A319-132 IAE". Ok, I did the reverse way, i.e instead to go from Rio de Janeiro (at sea level) to São Paulo state (much above sea level) I came from São Paulo to Rio de Janeiro and the all checklist items worked ok this time. 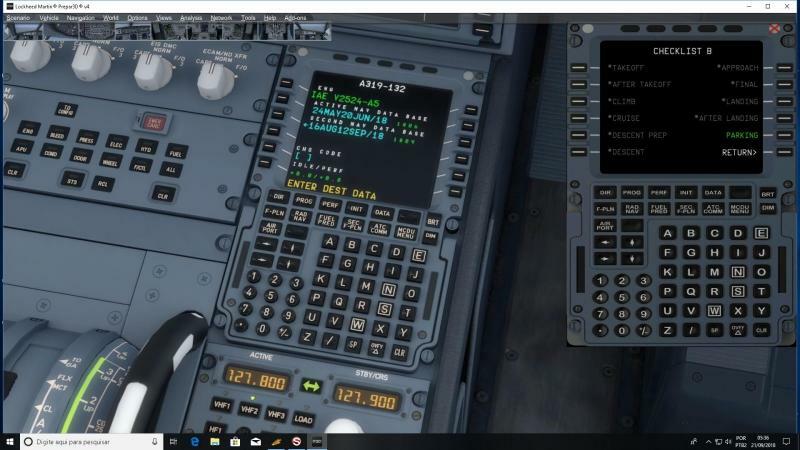 My P3D v4.3 has no other add-ons than Aerosoft Airbus Family Professional and PMDG 737NGX. Nothing more because my hardware is an entry-level. In my opinion the airport elevation can be one of the things that is contribuinting to the observed fail on the checklist after the LANDING checklist to be call out and the aircraft land sucessfully. What you mean about "... the rest is working well."? Is the "rest" the AFTER LANDING and PARKING? Richard, which model you were using, when this happened to you? I used the A320 CFM EasyStar. I flew from LOWS to LIPZ using route "DETS1A.DETSA LAREN LARE1C" and landing at runway 04R (ILS 109.95). 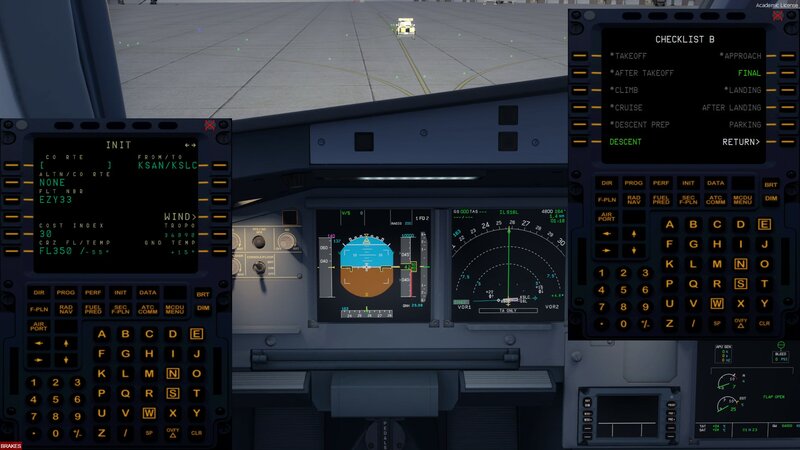 I used the A319-132 IAE GERMANWINGS D-AGNS and I can almost say that all the checklists went well, but I confess that I did not remember has been hearing the call out "LANDING" although it has ben executed (COPILOT ON). In short, it was a flight without any problem. *I used Navigraph instead of NavDataPro. I did another flight and I can confirm that all checklists for the A319 IAE are running except the call out LANDING that is not heard but is executed. The landing was on a runway (SBGL) that practically is at sea level. The route was "SBSJ UBS1A.DORLU ROPA1A DONGI SBGL", departing from rwy 15, crz at FL190 and landing using the ILS of rwy 10. Maybe it is linked or not but every time it happens the MCDU does not reset itself...?